Ametrine, also known as trystine or by its trade name as bolivianite, is a naturally occurring variety of quartz. It is a mixture of amethyst and citrine with zones of purple and yellow or orange. 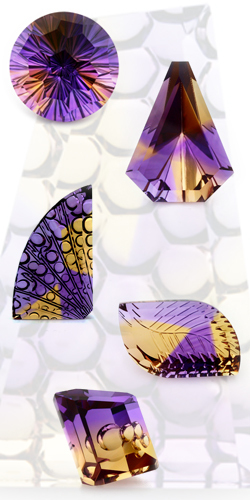 Almost all commercially available ametrine is mined in, although there are deposits being exploited in Brazil and India. Legend has it that ametrine was first introduced to Europe by a conquistador's gifts to the Spanish Queen, after he received a mine in Bolivia as a dowry when he married a princess from the native Ayoreos tribe. Most ametrine in the low price segment can surely be assumed to stem from synthetic material. Since 1994 a Russian laboratory has perfected the industrial production of bicolored quartz crystals that are later irradiated to bring out the typical ametrine colors. Green-yellow or golden-blue ametrine does not exist naturally.